Fun stuff. Check back this weekend for pics and updates on the GTM! Gotta start somewhere.........get er done! Try and get some sleep these next few nights. Cool. I'm sure you're not missing that camaro one bit..... Let the fun begin. congrats bro! cant wait till the day i stand in your shoes. maybe after this next deployment. Though you may try, you cannot break me. I am all that you wish you were but will never be. I'll do my best to get to sleep tonight, but I can't promise about tomorrow. a ten hour round drip drive to pick up the beast. thumbs-up and horns. We stopped twice for gas at highway service stations, and the trailer was swarmed by curious on-lookers. all the questions and compliments. I almost felt like a FF salesperson with the info sessions! is going to be a BLAST to build. I'm very impressed! Last edited by Procision-Auto; 08-28-2011 at 01:38 AM. What do you find is the best method to knock down the edge/flashing from the body molding? Also wondering if there's a good thread on general body work tips for fiberglass prep. I know very little about prepping, priming, painting. Thanks for the links. I'll continue to search, but there's just so much to read! Hopefully someone can show me what tool they used to knock down/cut the flashing without wrecking the body itself. THis is what I have gatherered so far. Depending on how good the seam is there are a few ways to tackle the seams. If the seam is good you can block the area on either side and this will bring it level with the surrounding area. If you're good with a DA you can use it instead. Then you can address the seam with a rotary tool. You only want to go until you hit the fg. The better the seam the less of a groove you'll leave for filler. The worst areas are usually the side scoop, hood latch and B pillar areas. I am very close to starting this part of the body work and the above is what I have gathered from the other forum as well as some direct Q&A from some members and my painter. I am not a paint/body guy. HTHs. Um, I don't think it advisable to use the rotary tool. You certainly want to take the seam down, and there may end up being areas that come up low and need some filler, but I would not go down to fiberglass with a rotary file on a body that you want to use as a finished product. If you can get the seams down while avoiding going entirely through the gel coat, I think I would do that. Just my opinion though. Thanks guys. I know it's a little bit early, but there is a great deal of work ahead of me. I want to make sure there's enough information under my cap before the work starts. block it down. There must be some detailed YouTube videos on Fiberglass prep along with member 'how-to' threads. Last edited by Procision-Auto; 08-31-2011 at 12:33 AM. I definitely see what you're getting at. I've seen some of the roadster guy’s seams that look like ditches. Overall my body's seams are pretty good so there's no need to create a ditch in most of the seams, however there are the areas that are not level between the two mated pieces and then there's the side scoop area. That's why it’s good to start by blocking the area to level the excess to the surroundings. Then you can inspect what you have and how best to proceed. I don't know of a more effective way to get the mold release wax out of the voids in the seams in the side scoop surfaces. This so far has been the worst area. It's my understanding that the lightweight filler used on the seams should be applied to fg and not gel coat. Again, I'm not a body/paint and this is what I've gathered from the forum and direct member Q&A. If using Rage do you recommend blocking down to the fg? Do the voids you expose need to have the fg exposed? I'm doing the body work myself and want to have a solid job when done. Thanks. I haven't used Rage - just know it is highly recommended for use on fiberglass - As I do most of my work with epoxies. However, I have used in the past LSC, Tigerhair for rough filling and the better quality surfacers - I prefer to finish coat with an epoxy/ fairing compound, and no matter what , I always use an epoxy primer - mostly awlgrip 545 - and I have topcoated that with base/ clear, imron, ppg dbu, sterling or awlgrip . wiring the steering column harness. is why there is a Painless Wiring kit included with the car. Is the Painless Wiring kit part of the GTM package when ordering from the factory? to find a key, there is a toggle switch. Perhaps this column is meant for a push-button start deal? back to work will be very appreciated! Last edited by Procision-Auto; 09-01-2011 at 10:44 AM. The only key from FFR is the ignition key (they provide the ignition cylinder and key). There are no keys for the door locks, etc. Some have made the Corvette locks functional, but you will need the Corvette keys. I believe most have not done this. I shaved my door handles and will be using solenoids and poppers. Steering linkage is too long. Bore and tap or cut the threaded rod from the rack. Both solutions have been done. Also wondering if there are door key looks, and a steering column lock? *Yes Sir. 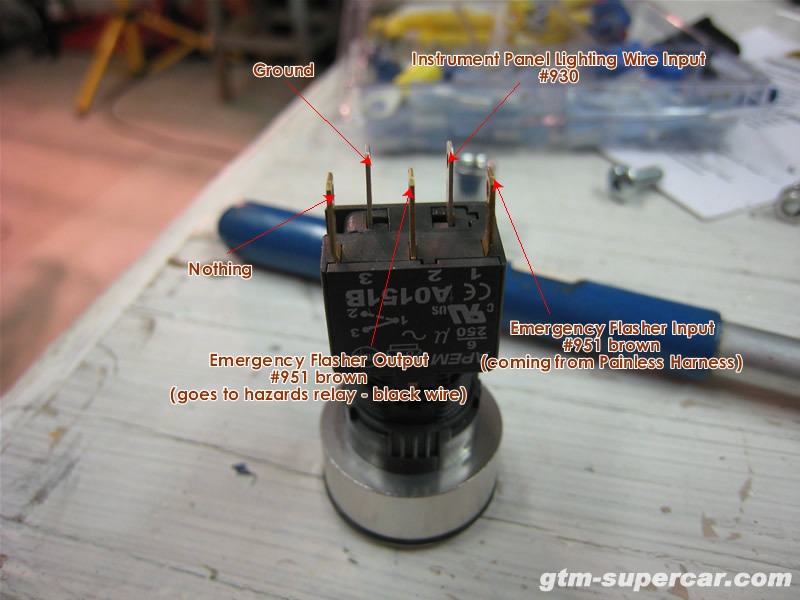 An 18 Circuit GM Column Painless Wiring Kit is included with the kit. *No door locks. However the latches do have a mech that you are instructed to remove before installing. Many go with "shaved handles" and poppers. *The portion of the steering wheel lock that the pin would go through is removed with the airbag. So you will not have a column lock. *The corvette steering column does not house the ignition switch. In the corvette it resided above your right knee. The switch on the column housing is for the telesoping function of the column. *You will have to shorten the rods on the steering rack. I love you guys...in a non-sexual internet kinda way! Now hurry up so we can see some building progess on the "My Official GTM Build Thread!". On a serious note. You're doing the right thing by going through the manual and inspecting what's been done. If you haven't, I would highly suggest you read the "Links to $64K Questions" on the other forum as well. It will let you know alot of what you'll be facing and answer many, many questions. Thanks, I'll check out that link later tonight. Thanks again for the quick replies & help earlier (both of you). This forum has been great with facts and tips! a total loss. I'll have to buy some washers, nuts and hardware from the local Home Depot tomorrow in order to move ahead. next round to assemble the car. Total build time thus far: 30 mins. Last edited by Procision-Auto; 09-02-2011 at 04:18 PM. Today I finally made some headway on the build. The steering column wiring was sorted, routed, cut to length and soldered/heat shrunk into place. ideas. These buttons may be used to trigger certain custom features (IE: "Set" = push button start, R/A = LCD monitor mode cycling). it will make it easier to get in and out of the car. Just a couple of photos (boring...I know). The SCM held the circuit for the column in the corvette. There are 3 memory positions and entry/exit assist. If you'll be using a stock PCM you can use your cruise control. assuming it's some sort of box with pin harness. Does anyone have a photo of this bad-boy? If it's not too expensive, I'll grab one from the dealer/or used, otherwise I will design something similar. A stock PCM is the most likely choice, but I'm not sure that I'l be using drive-by-wire throttle body. Last edited by Procision-Auto; 09-05-2011 at 10:17 AM. The SCM is mounted under the driver's seat in the corvette. I have mine in the tunnel. I moved it up to take the picture. I kept it from my donor so I wouldn't know the cost. I took a close up of the tag for the part number. HTHs. There is a black plastic box with similar looking harness connections; again thanks for taking the photo. hang the body to the ceiling of my garage, but for now it's posted against the rear tires. and pushbutton instead of using a key to start the motor. Total build time 3.5 hours. everything works before the hard-wiring begins. to design a warning indicator for engine sensors that are approaching their hazard zones (IE: high temp., low oil pressure, low fuel, etc.). This would be separate from the PCM malfunction indicator (MIL). to make it look nice. Another small roadblock that I'm hoping the experienced builders can help with! Having purchased a used kit, I'm getting the feeling I don't have all the necessary parts or instructions for assembly. The large Factory Five GTM manual doesn't appear to have specifics on the wiring for these. Could this be the one? Wiring diagram anyone? I didn't use the painless so I can only help you with the switches pin-outs if you need it. However I would highly suggest you look at Spytech's site. Do a search there for flasher or switch. I would also suggest a search on the other forum. I'm certain you'll find your answer. HTHs. There was an electronic update to the manual and the new manual has the fog and hazard instruction. It's too large to attach here. SpyTech has the Hazard switch documented in his build log. On the right side of his page, click on "wiring". Scroll down to the bottom and there is an section that explains which wires to match up to wire it correctly. Shows how the dash, stereo, and gauges were wired. Scroll to the bottom, and you'll see his instruction for the Hazard Lights. Last edited by The Stig; 09-22-2011 at 12:29 PM. of the Hazard wiring, I don't believe my problem will be resolved. the button the signal to pin #2 is lost (but the hat will stay down and illuminate the LED). type button. Maybe I'll make a video to explain. Great site links, thanks again for the quick reply! Here is a quick video of the switch function. The Hazard and Fog Lamp siwtch work the same way. them swapped for the proper type is an option. Perhaps I can order them through a local electronics supplier. Can you seperate the two? Both the hat portion and the other part should be latching switches. Seperate the two and test it by itself. And since it hasthree additional pins I would test them too. We not the hat it latching. I think the other part is not and the hat's post is backing uff just enough for the connection to go back to open. Oh and thinks for the shoutout. I'll give it a shot when I get home; both the Fog Lamp and Hazard switch are doing the same thing. Chances of both being faulty are slim, but who knows?! Hopefully the odds will be in my favour!